The spotlight can’t keep up with him. Rudy Giuliani, to a standing ovation, has just taken the stage in a Montreal concert hall, and as he begins a lecture titled “Leadership in Difficult Times,” he seems determined to take the entire stage. Giuliani paces rapidly from extreme left wing to right and back again, audible through a wireless microphone clipped to one lapel of his natty gray suit. For several long minutes, though, he is invisible. Except for the few seconds when he strides through the glowing circle of white light at center stage, Giuliani is a voice from the darkness. Either no one warned the spotlight operator about Giuliani’s mobility, or the poor guy has been fooled by the former mayor’s three introducers: They gushed about the evening’s star guest in both French and English while standing stock-still behind a wood-paneled lectern. Rudy is on the move. Rudy is vital. Finally, the follow-spot operator gets with the symbolism, and Rudy is illuminated. For the next hour, he strides nonstop from side to side. Two huge TV screens behind Giuliani magnify his face for the cheap seats – well, the distant seats, since prices start at $100. For an extra $750, you got appetizers and a pre-speech snapshot with America’s Mayor. The 2,700-seat Place des Arts is sold out. Giuliani opens with wit – a self-deprecating anecdote about his boyhood failure to make the church choir: “The nun told me I had a particular kind of voice … a monotone voice” – but quickly moves on to wisdom. His “six principles for getting through a crisis” are a Cliffs Notes version of his forthcoming book, Leadership. Sun Tzu, Anthony Robbins, and the author of Who Moved My Cheese? have nothing to fear from Giuliani’s management insights. “The first lesson,” he says, “is that you have to have a set of beliefs.” Next come “have courage,” “stand up to bullies,” “relentless preparation,” “teamwork,” and “communication.” Not surprisingly, Giuliani is in favor of all of them. Yet as the crowd files out, into a subterranean marble-floored lobby that leads to a shopping mall, the electricity is overflowing. “That was soooo inspirational!” swoons a woman in a black velvet evening gown. Rudy Giuliani is the official road company of 9/11. Since departing City Hall on December 31, he has traveled from Baden-Baden to Vancouver, from Salt Lake City to Charlotte to Shanksville, charging $100,000 for some speeches. In some places, he plugs his book and his beliefs, and adds to the $185 million he’s raised for the Twin Towers Fund. In others, he promotes the Republican candidate for whom he is the fund-raising attraction. But what he actually says matters – as Giuliani would put it – very, very little. People yearn to experience his presence. And it goes far deeper than celebrity. Giuliani is an authentic American hero, a man whose days of sadness and glory were felt in real time by tens of millions in a shared cultural moment of overwhelming emotional power. On September 11 and in the awful days that followed, Giuliani acted as we all want to believe we would in the face of danger – and as we all fear we wouldn’t. One year later, people flock to give thanks to Giuliani for his strength and moral clarity. But he has also become an icon in which people invest their civic spirit. So extreme right-wingers who previously castigated Giuliani for his abortion liberalism, like New Hampshire Republican senator Bob Smith, now plead with the former mayor to cut a campaign commercial. Democrats are reduced to praising Giuliani while demurring, very mildly, about his voting-booth coattails. The grief is never more than an arm’s length away. Just the other day, Giuliani was suddenly in the mood for a soda but was short of change. One of his bodyguards rooted around in a pocket looking for some coins. Instead, he pulled out a firefighter’s Mass card. Giuliani and his aides went silent. Most of the time, however, the 58-year-old Giuliani is happier and healthier than ever. Surviving prostate cancer and the terrorist attack enlarged his perspective. But in analyzing his current sunny outlook, Giuliani’s friends all point to a common influence: Judith Nathan. “He loves her to death,” says Bernard Kerik, Giuliani’s final police commissioner and now a business partner. Though the couple spends an occasional weekend at Nathan’s Southampton condo, she frequently hits the road with Giuliani. Four days in June took him from Chicago to Richmond to Washington to New York. Three days in August brought speeches in Colorado Springs, New Orleans, and Calgary. 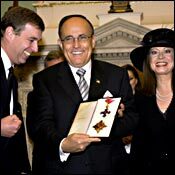 One night in Washington, Giuliani raised $7.5 million for the GOP’s National Congressional Campaign Committee. Giuliani has also been the headline act for the Columbus, Ohio, Speech & Hearing Center; at the Choice Hotels International 48th Annual Convention in Atlanta; at the Society for Human Resource Management 54th Annual Conference and Exposition in Philadelphia; at the 2002 Million Dollar Round Table, a meeting of financial advisers, in Nashville; at the American Road & Transportation Builders Association 100th anniversary gala, in Washington; and at the Snapple convention at Chelsea Piers. He has appeared at the Thomas Jefferson Awards and the MTV Awards. In the past eight months, Giuliani has shared a dais with Scott McNealy, Bill Gates, Mike Krzyzewski, David McCullough, Stephen Ambrose, Willard Scott, Star Jones, the executive vice-president of Ducks Unlimited, and the paraplegic teenage daughter of race-car driver Al Unser. Farrell says Giuliani updates the survivors on his efforts to maximize the memorial space at the Trade Center site and counsels them on where and when to apply their own lobbying. “He has become, for us, a beacon of hope,” Farrell says. The dark-oak-paneled offices of Giuliani Partners are on the twenty-fourth floor of a new skyscraper at the corner of 42nd Street and Seventh Avenue, built by Mort Zuckerman as part of the Times Square redevelopment that Giuliani ushered along as mayor. Giuliani has the largest space, with a picture window with a spectacular view north. Directly across the street is the zipper building, One Times Square. Sometimes Giuliani looks out and remembers the day three years ago when he watched an emergency scene here: A giant mylar sign was flapping loose from One Times Square, and 20 floors off the ground a firefighter dangled to tie it safely back down. The firefighter was Terry Hatton, the husband of Giuliani’s assistant then and now, Beth Petrone. Three weeks ago, Giuliani attended the christening of Petrone’s 3-month-old baby daughter. Hatton died at the World Trade Center, never knowing his wife was pregnant. When Giuliani walks the thick gray carpet leading from his suite, he sees many of the same faces who’ve orbited outside his office for twenty years. The other partners at what employees call G.P. are Denny Young, who goes back to Giuliani’s eighties days in the U.S. Attorney’s office; Michael Hess, most recently the city’s corporation counsel; Tony Carbonetti, chief of staff in Giuliani’s City Hall; and Teitelbaum. Tom Von Essen, the former fire commissioner; Richie Scheirer, former head of the city’s Office of Emergency Management; and Kerik are senior vice-presidents. 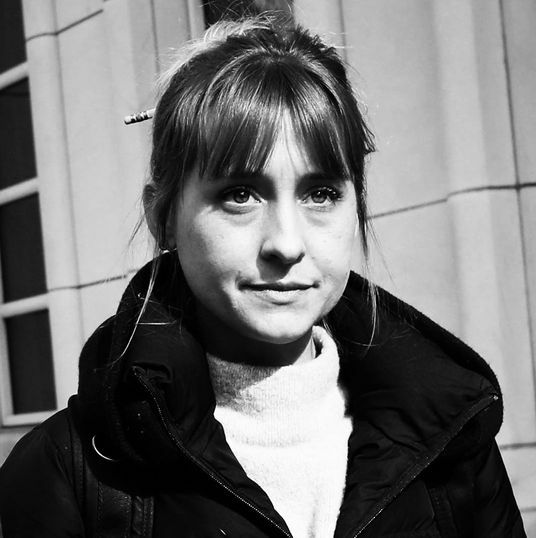 Sunny Mindel, communications director, is as potent a force at G.P. as she was as Giuliani’s mayoral press secretary. The one prominent newcomer is Roy Bailey, a Texas financier, who came aboard to handle the firm’s investments. Giuliani Partners admits to only four clients; its other deals are either said to be “in formation” or confidential. The first, Merrill Lynch, came aboard in April. Giuliani has been friends with senior Merrill executives for decades. But his loyalty, and his eagerness to sign up a big-name client, led Giuliani into a mistake. When New York attorney general Eliot Spitzer went after Merrill for publicly hyping what its analysts believed to be overvalued stocks, Merrill asked Giuliani for help heading off both a possible fraud prosecution and a certain public-relations debacle. Giuliani called Spitzer – and was promptly, embarrassingly snubbed. 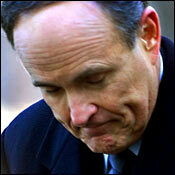 Giuliani was too late; Merrill caved, paying a $100 million settlement. Spitzer made his decision on the merits of the case, but Giuliani’s call also triggered a sour memory: When Spitzer was elected attorney general in 1999, he placed a courtesy call to Giuliani. The mayor never called back. Giuliani’s third police commissioner has been working with Purdue Pharma, the drug manufacturer plagued by the theft and abuse of its OxyContin painkiller. “The mayor and I just met with Asa Hutchinson, the director of the DEA; his staff; and people from Purdue,” Kerik says. “We don’t want Purdue put in a position where it winds up being taken over by the courts. Or they get put out of business. What I’d like to see come out of this is we set model security standards for the industry.” Coincidentally, last week Giuliani raised $15,000 for the DEA’s traveling museum. This afternoon, the windows of Giuliani Partners offer a prime panorama of fury. Down on Broadway, 10,000 cops and firefighters are raging about their lousy pay. And many of the angriest signs and most profane chants are directed at Rudy Giuliani, whom they blame for not giving them a raise before Wall Street went bust. Kerik, descending by elevator for a lunch appointment, dons a pair of sunglasses and hustles warily down the sidewalk. Prosaic disputes over wages and budgets are Mayor Michael Bloomberg’s problem now. Giuliani has strenuously avoided any public criticism of the successor he installed with a single blockbuster TV ad. Yet the old Giuliani, who wasn’t satisfied with anything less than total victory, has begun to resurface. Even though Giuliani’s call for a “soaring memorial” had defined the terms of the debate for redevelopment at the Trade Center site, he’s renewing his demand that the entire site be sanctified, pushing a confrontation with Bloomberg. And the size of the memorial is just the beginning of the squabbling: Privately, Giuliani is extremely critical of what he thinks are Bloomberg-administration blunders, on everything from a too-generous teachers’ pay hike to the elimination of the Police Department’s Street Crime Unit. Rudy Giuliani doesn’t have to be here, standing in the sun in a church parking lot on a sweltering August morning, waiting quietly an hour past a funeral’s scheduled starting time with hundreds of firefighters in dress blues. But here he is, in Seaford, Long Island, as he has been in dozens of other suburbs and neighborhoods whenever possible, to pay his respects to yet another fallen hero, Lieutenant Patrick Lyons of Squad 252 in Bushwick. Inside Maria Regina Church, the mourning is standing-room-only, with 1,200 people crammed into the pews. Above the altar, two beautiful, abstract stained-glass windows glow in the sunlight. Beside the altar is Lyons’s framed red-and-white No. 10 jersey, the one he wore leading his beloved FDNY football team. Some of the eulogies are slick (the pastor, who admits he didn’t know Lyons very well), some are achingly raw (firefighter Pat Alfarone, who opens his mouth to speak but stands mute and sobbing). Only Giuliani receives an ovation on the way to the podium. He has presided over hundreds of these terrible commemorations since September 11. He isn’t a grand orator, but his humble phrases carry genuine gravity. 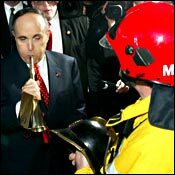 “When I first realized on the morning of September 11 how many people were going to be lost, had died, in the attack, particularly how many of our firefighters, police officers, rescue workers, I kept trying to calculate how many, because I knew I would have to answer,” Giuliani says in a low, steady voice. “And the number was just impossible to even think about. I knew then that we would feel this pain, that it would just ripple out all over this city, all over the state, all over the country, and all over the world. But you don’t realize until you deal with an individual’s family, the firefighters, all of the impact it has, what a horrible thing they did to us … ” His voice trails off, and Giuliani seems to be back walking in the rubble again for an instant. The crowd is instantly on its feet, and for a full, cathartic 60 seconds, palms bang out a loud tribute. As the ovation crescendos, the former mayor, also clapping, leaves the pulpit and walks back to his pew. It is a canny gesture, one he has used at funerals before: In that moment he is selfless, merely one of the appreciative citizenry, surrendering the spotlight to the true hero. But Rudy Giuliani is riding that applause, too.